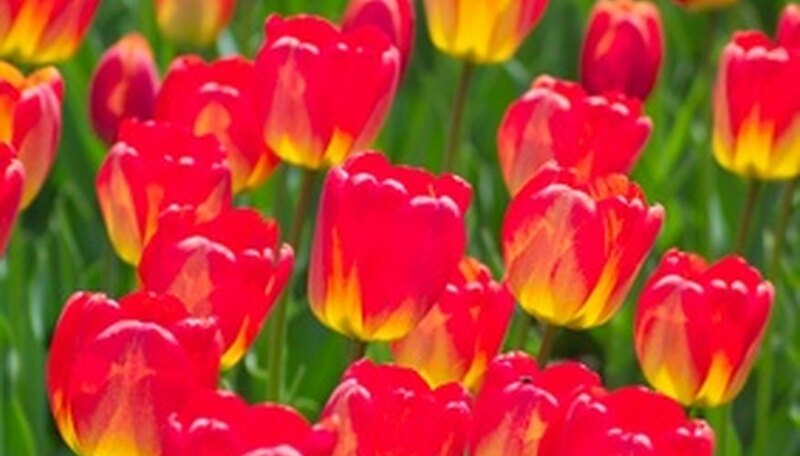 Bulbs offer brilliant blossoms, produce ideal cut flowers and a low-maintenance plant. Daffodils, tulips, grape hyacinths, Dutch hyacinths, anemones and irises all grow well in Texas. A few require a little extra care to produce blossoms since Texas often does not offer the extreme cold weather they require to flower, but all bulbs will grow in the region. Bulbs offer the versatility of being planted directly into the flower garden or in containers to grace porches and patios. Select only high-quality bulbs that are free of disease. Look the bulbs over closely. They should appear firm, large and free of any areas of rot. There should be no wounds or cuts on the bulbs. Plant daffodils, grape hyacinths, anemones and irises in October. Plant tulips and Dutch irises in January or February. Store tulips and Dutch irises in the refrigerator for 60 days prior to planting so they receive a sufficient amount of chilling time to grow. Dig a hole that is 6 inches deep. Work peat moss into the soil at a ratio of 50 percent peat moss mixed with 50 percent garden soil. Space daffodil, tulip and Dutch iris bulb 6 inches apart. Space tiny anemones and grape hyacinths 3 inches apart. Iris and Dutch iris bulbs should be spaced 12 inches apart. Cover the bulbs with the soil and peat moss mixture. Water thoroughly. Apply 3 to 4 inches of peat moss or bark chips for mulch. Clip spent flower heads and discard after flowering. Allow the plants foliage to naturally die back, which occurs mid-summer in Texas. Clip the dead foliage and discard. Replace any mulch to the bulb cover that might be lacking. Divide bulbs every few years by digging them up after the foliage has died and dividing the bulbs. Replant the bulbs in their new locations immediately. If it is necessary to store the bulbs and replant in the fall, store them in a cool, dark place until planting time.